Monochrome photograph of Murdo Macpherson taken in December 1961 by Willie Morrison. Murdo and his squad had been cleaning up after some flooding. He is remembered as a very courteous man, always ready to have a chat, and although he was a war hero, who had seen a lot of nasty things, he was very modest about it. 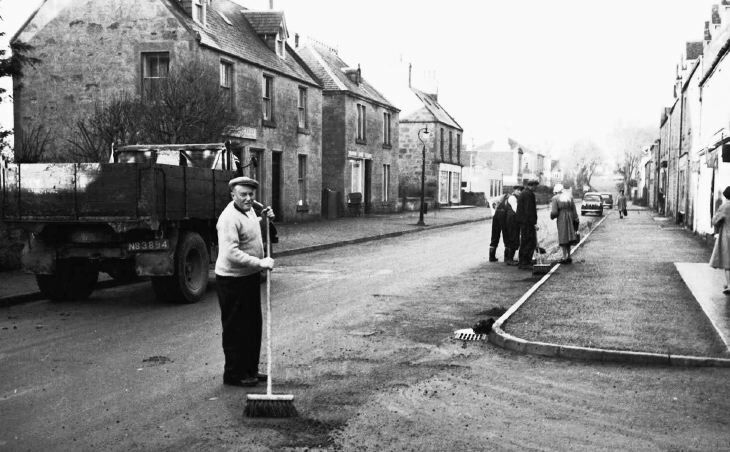 Willie Morrison recalled seeing him wearing his Military Medal during a Remembrance Day parade when at school in Dornoch, and asking him what he got it for - but for once, he was very non-committal. That was Murdo. This is the photo that started me off on my search. A friend typed in Murdo Macpherson, and lo and behold, came up with this one. He is my Grandfather, who worked with Sutherland Council, I think, at that time. He was born in 1896, and died 20th June 1966. My Granny, Jessie ( Murray) died 8th January, 1990, I think she was 92 when she died. Murdo Macpherson, pictured above, was my Grandfather.At this time, he stayed at Ceol-na-Mara, Achvandra Muir. Sadly, he died in 1966, and my Granny, Jessie, nee Murray, died in January, 1990, aged 92.They were married on 26th December, 1919, and at this time, my Granda was a woodcutter. I would be very grateful if anyone could verify these details, also I would like to find out if there is any way of obtaining copies of these photos in my album. Tell Muriel that her grandmother and my granfather Dan Murray were brother and sister. There was quite a large family, I think my grandfather had at least six sisters and they all lived to a good age. My Granfather was in fact a forestry manager and possibly he worked with Murdo during his early life but I remember Murdo as a great fan of local football and used to follow us at every oportunity and was never shy about venting his feelings from the touchline. I last remember Murdo working in Grant and Sons boiling Haggis in a large cauldron, that was about 1964 before I left the town. Mary his daughter still lives in Dornoch. Hi Dan, Muriel here, I haven't been on for a long time as my computer went haywire! I got my grandson to fix it, so I'm back in action again. I was actually speaking to Auntie Mary on the phone last night, as I've had contact from my cousin Murdo from Canada. There's a bit of a mystery there though? which I'm just trying to phathom out, but I'll let you know! Where are you now? I'm trying to remember, and correct me if I'm wrong, was your Dad an inspector on the buses? Delighted to see the interest taken in Murdo, whose home I visited a number of times during schooldays. He and Jessie were very kind people. Muriel, if you haven't yet got a copy of that photo, you're very welcome to one if you e-mail me at willie@kenilweb.com Dan, I take it you're the Dan Murray whose grandchildren are my grandnephews and grandniece, though I haven't seen you for a wee while.